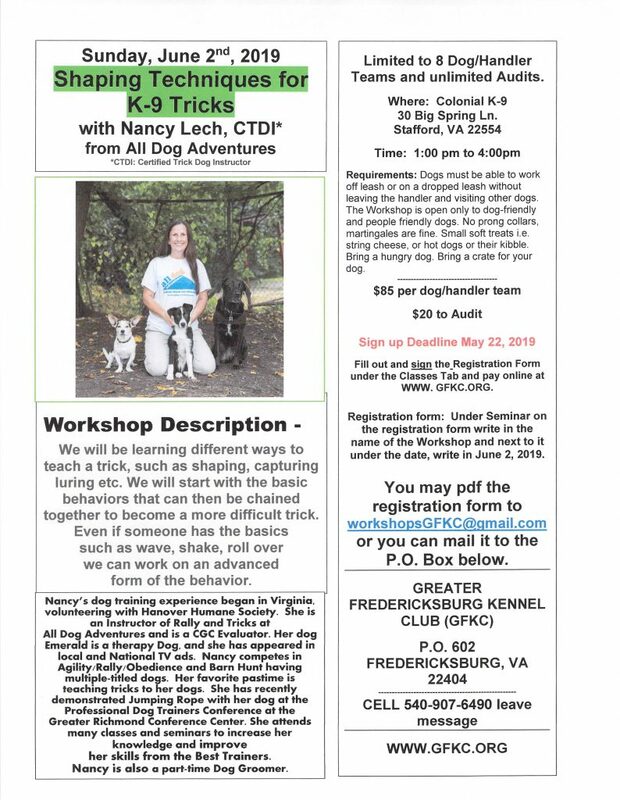 The Greater Fredericksburg Kennel Club was founded in 1970 under the name Rappahannock Valley Breeders Association by a group of dedicated dog fanciers. Several of the founding members remain active in the club. In 1973, at the suggestion of the American Kennel Club, the name was change to the name we have today; the Greater Fredericksburg Kennel Club. In 1977 approval was granted to conduct licensed AKC events. GFKC has continued to grow and serve the breeders, exhibitors, pet owners and the community. The Greater Fredericksburg Kennel Club will: further the advancement of all breeds of purebred dogs, do all in its power to protect and advance the interests of all breeds of purebred dogs, and encourage sportsmanlike competition at dog shows and performance events. GFKC welcomes all mixed breed dog owners who are dedicated to and passionate about enhancing the life of their canine companions. As part of its mission, GFKC will provide means of informing the public about (1) the standards for purebred dogs, (2) availability of sound registered dogs as pets and show prospects, and (3) conduct sanctioned matches, dog shows, and performance events for purebreds and mixed breed dogs under the rules of the American Kennel Club. Meet – Meetings are held every second Thursday of the month at 7:30 pm (7 pm if program scheduled) at Christ Lutheran Church, 1300 Augustine Ave., Fredericksburg, VA 22401. Occasionally we will meet at another location to include our dogs. Please check the calendar of events. We meet to discuss club business, plan events, gather for special programs and talk about the latest happenings in the world of dogs. Prospective new members and guests are always welcome. Classes – GFKC provides classes for members and the general public. We offer classes in Agility, Obedience, Puppy Kindergarten and Handling/Socialization. See our Classes page for more information. Hold Events – Every year we hold a Conformation Show, an Agility Trial, and an Obedience and Rally trial, plus numerous other smaller events. These events are held at the Fredericksburg Expo Center and the Fredericksburg Field House to name a few. They are open to the public with free admission. Public Education – One of our main goals is to educate people in the many aspects of pure bred dogs. CANCELLATION POLICY. In the event there is inclement weather, i.e. snow or severe storms, on a meeting night, class day, or any other scheduled GFKC event, a notice will be provided on this website as well as on the Facebook page. You may also contact the appropriate instructor for that event via email or phone.